Drenches your skin with moisture using an advanced process known as the Intercellular Active Transport System (ATS17) to deliver amino proteins and humectants into the skin where they are needed most. Naturally exfoliates dull, flaky skin cells from the skin's surface (much stronger than AHA's without any irritation or burning). Helps to naturally restore the skin structure by penetrating the skin's surface and delivering amino acids and humectants that are necessary for collagen and elastin creation. SPF 15 works to protect skin against damaging UVA and UVB rays. 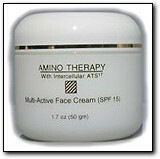 With continued use, your skin appears younger and your skin tone becomes more even. Fine lines seem to disappear and your skin feels softer and healthier than ever before! Directions For Use:Apply to freshly cleansed face and neck, morning and night.